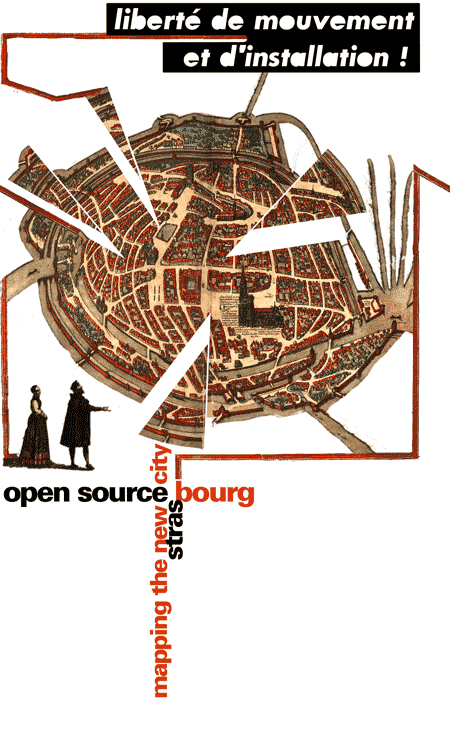 Open Source City is a 10 days event bringing artists, cartographers, architects, programmers, activists, occultists, psychogeographers, autonomous astronauts, researchers, doctors, sociologists and urbanists together to draw an 'open source' map of the european city of Strasbourg. The festival will focus on historical maps, psychogeography, politics and religion; Europe institutions and local specificities; tactical media and cyberguerillas techniques, locative tools and wifi maps; urbanism and city politics. The festival 'Open Source City' is organised by the Syndicat Potentiel, with Université Tangente and Ellipse. The 'Trans-Cultural Mapping' program stops in Strasbourg for the 'Open source city: collaborative mapping' workshop. The Strasbourg TCM workshop will follow the 5th RAM workshop entitled 'Open Source Media Architecture'. Open Source ideas -- that has its origins in the scientific and computer programming communities, where research is shared within a network for the common advancement of the field -- will be used and extended in both events. An exhibition will be set up and modified until the final version that will stay in Syndicat Potentiel space one month after the festival. The Strasbourg results will be presented in Riga for the Art+Communication Festival organised by the RIXC in october 2004 as a cloture of the TCM program. Open Source City includes psychohistorical walks in city center, psychogeographical studies and drifts through the city using wearable computing devices, wardriving, open source mapping jams, city scale Go game, unitary urbanism re-considerations, and lectures with Brian Holmes, Karen O'Rourke, Thierry Ramadier, Thierry Hatt, and panel discussions with participants. The 'Trans-Cultural Mapping' program is a European Union Culture 2000 program for 2004 in the special event section for the celebration of the European enlargment. The lead organisation is the Center For New Media Culture, RIXC from Riga (Latvia) and co-organised with K@2 (Latvia), Projekt Atol (Slovenia), Piknik Frequency (Finland), TEKS (Norway), LORNA (Iceland), Ellipse (France). >from *OpenSourceCity *. via joan. > [ram5]: open source media architecture. the open source concept, applied in contemporary practice of architecture, locative art and streaming media. riga, may 4-9, 2004.